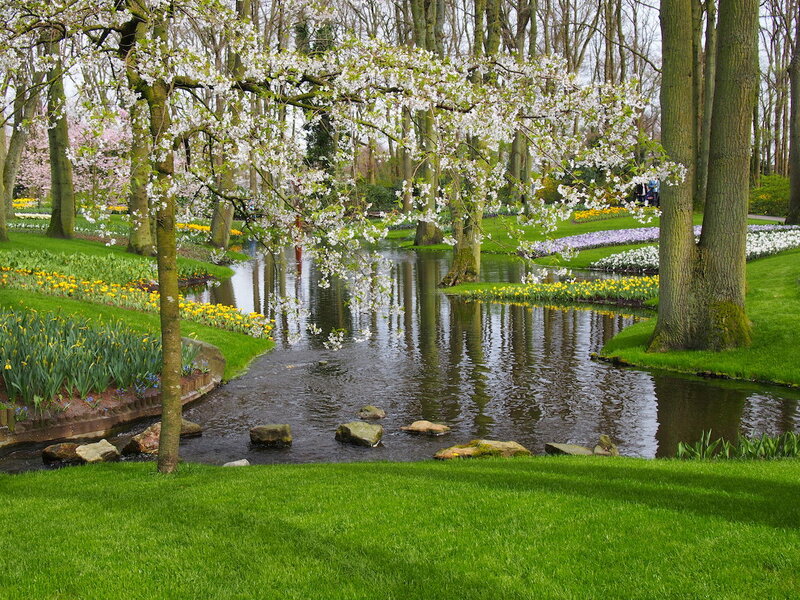 The Keukenhof Garden, near Lisse in the Netherlands, is probably the most famous spring garden in the world. In the eight weeks the garden is open, from March until May, over a million visitors will fill its 32 hectares (80 acres). The history of the garden goes back centuries and the name originates from the 15th century, meaning “kitchen garden”. Landscaping began in 1865 and in 1949 a group of flower bulb growers and exporters put forward the idea of having an exhibition there to showcase their wares. This exhibition has developed into the display we can see today. 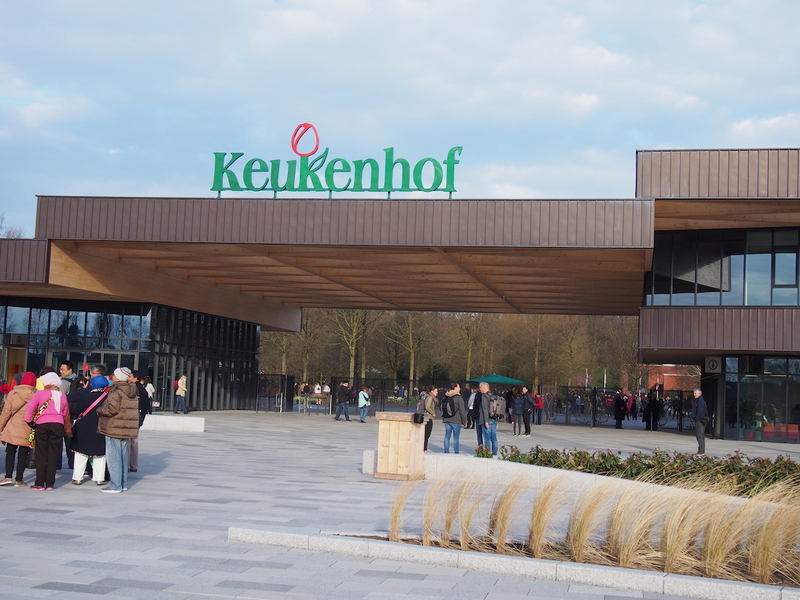 This year, Keukenhof celebrates its 68th anniversary with the opening of a new visitor entrance, designed to make access to the garden and its facilities easier. With 75% of visitors coming from abroad, many in large parties, the flow of people through the old gates and into the garden was becoming congested. The new entrance is wide and open and the old one has been transformed into a pleasant seating terrace next to the dandelion-clock fountain and traditional street organ, playing its curious mix of old and new tunes. For the enthusiast, this collection of spring bulbs is educational as well as beautiful. 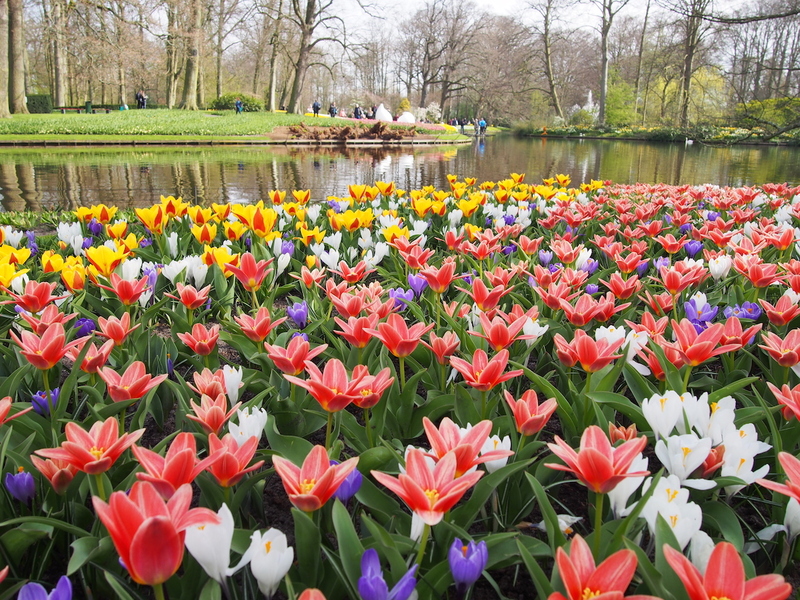 The first tulips were brought to the Netherlands in 1592 and you can follow their development throughout the gardens, including in the Tulipmania exhibition, which tells the tale of the time when a single bulb could cost the same as a house. 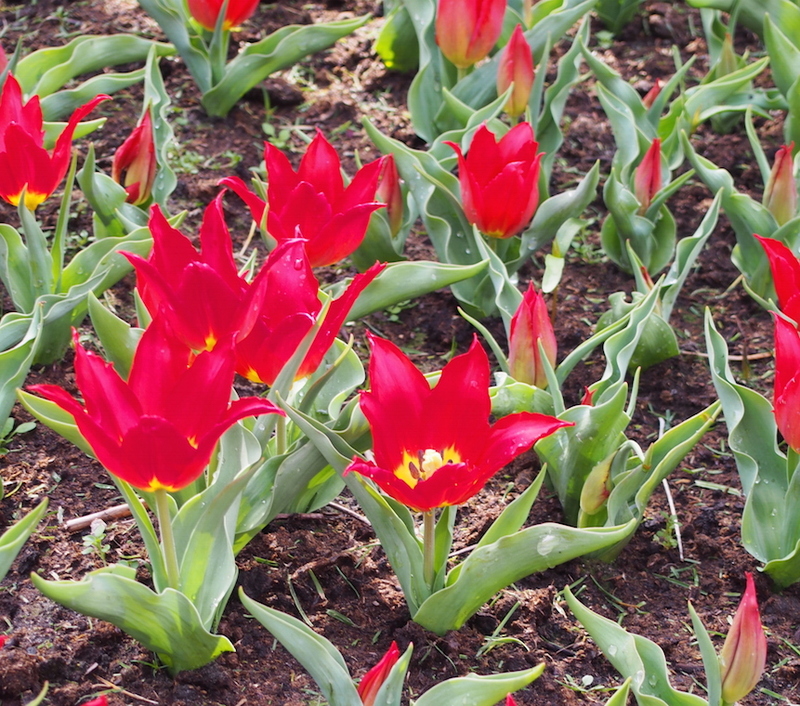 Some of the very earliest tulips still in existence, including ‘Lac van Rijn’ (1620) and ‘Cochineal’ (1700) can be seen in the Historical Garden. Every year, 7 million bulbs in 1600 varieties are supplied by almost 100 growers and planted in the garden, from September to November, in a different design each time. 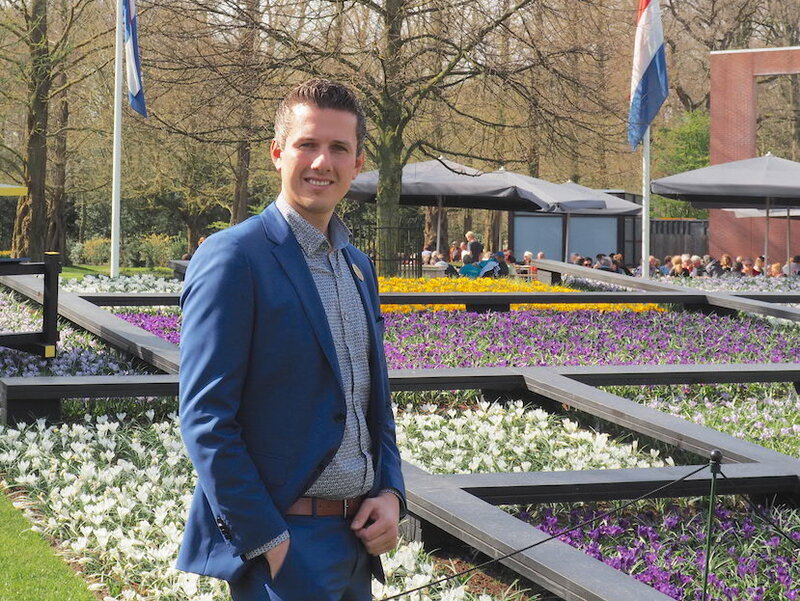 In charge of all these designs is Martin Elling, now in his third year at Keukenhof, and he is constantly assessing the results to see how well his plans have worked. He regularly walks through the gardens with the growers, deciding on plans and plants for the following year. Martin has changed many of the single-variety beds and borders for mixed, layered plantings that will give colour and interest for the full eight weeks that the garden is open. As each type of bulb dies off, another is ready to take over. Careful attention to details like dead-heading and staking floppy flowers like hyacinths means that whether you visit in March or May, the display will be perfect. Flowering starts with crocus, anemones and early narcissus at the beginning of the eight weeks, progressing though fritillaries and hyacinths, and the many early, mid and late narcissus and tulips to lilies. Passing along the 15 kilometres of paths, beneath the 2500 trees (in 87 varieties) there is a glorious view everywhere you look, particularly around the serene central lake with its impressive fountain and the windmill, which dates from 1892. 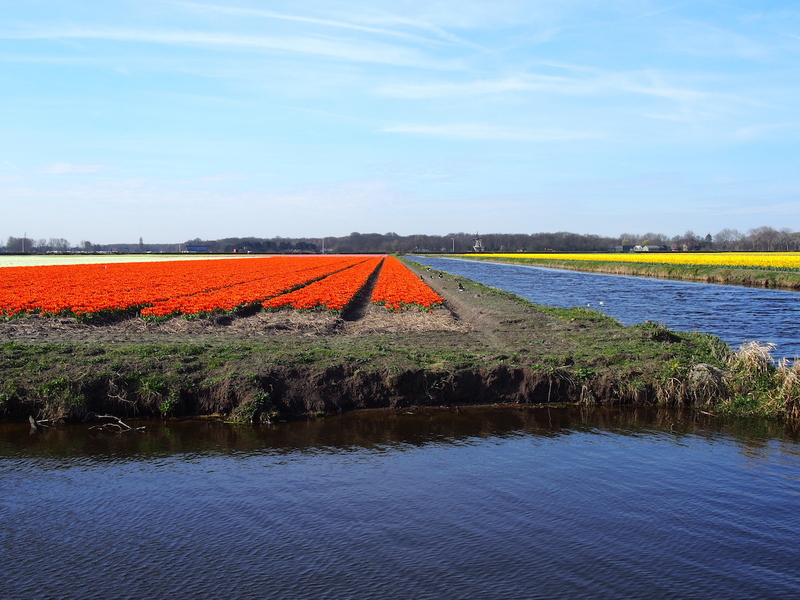 You can tour the local bulb fields in a “whisper” boat along the canals, so-called thanks to their eco-friendly electric engines. This is a great way to get close to the flowers growing en masse in the fields and smell their wonderful fragrance. Not even rain spoils the enjoyment because there are 4 indoor pavilions covering 15,000 m2. 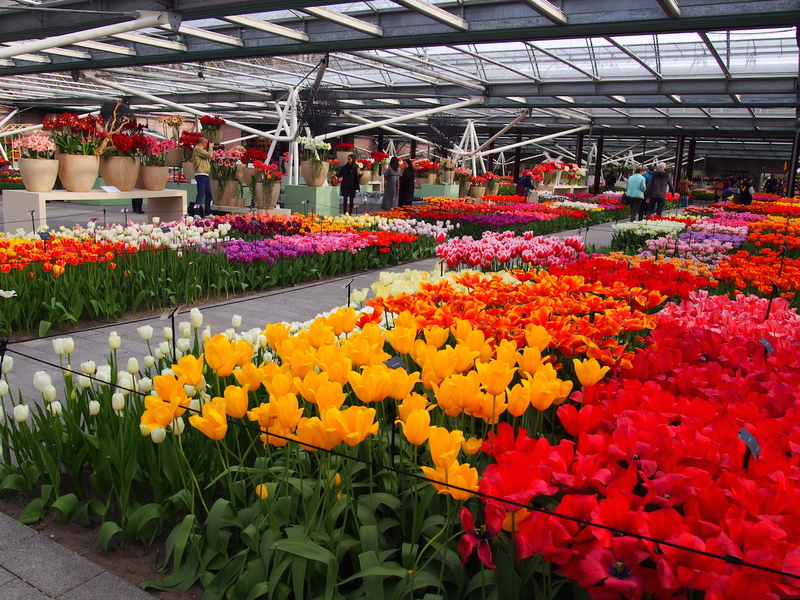 The Willem Alexander Pavilion showcases hundreds of tulip varieties, all protected from the weather and clearly labelled, should you wish to make notes for future use at home. The Beatrix Pavilion is filled with orchids and anthuriums; the Juliana Pavilion hosts the Tulipmania exhibition. The Oranje Nassau Pavilion is ideal for the flower arranger, with weekly changing displays of flowers like freesias and anthuriums, and daily flower arranging demonstrations. If all this sounds like an advert for Keukenhof, it’s simply because this garden is so stunning. It’s hard to describe just how beautiful it is and how the serene setting uses the stately trees and water (both still and moving) to make it feel calm, even when it’s busy. Deliberate effort has been made to provide entertainment for children, in the form of climbing frames, trails and a petting zoo, in certain areas whilst leaving others for those wishing to enjoy peace and quiet. Seats in these areas allow you time to enjoy the view, the birdsong and the fragrance of the flowers - or just have a rest. If you get the chance to visit, it’s well worth it. Take a notebook for new ideas and your camera - but take the time to enjoy it without the viewfinder as well. Oh yes … do sample the food in one of the many cafes, we can especially recommend the Dutch apple pie!